Gonna be a busy and fun fall with lots of Demo Days that will give rise to lots of Story Circles. Yesterday we launched the first Story Circle for USGS folks (both scientists and communications staff) who took part in the Colorado Demo Day in March. We’re just getting started. 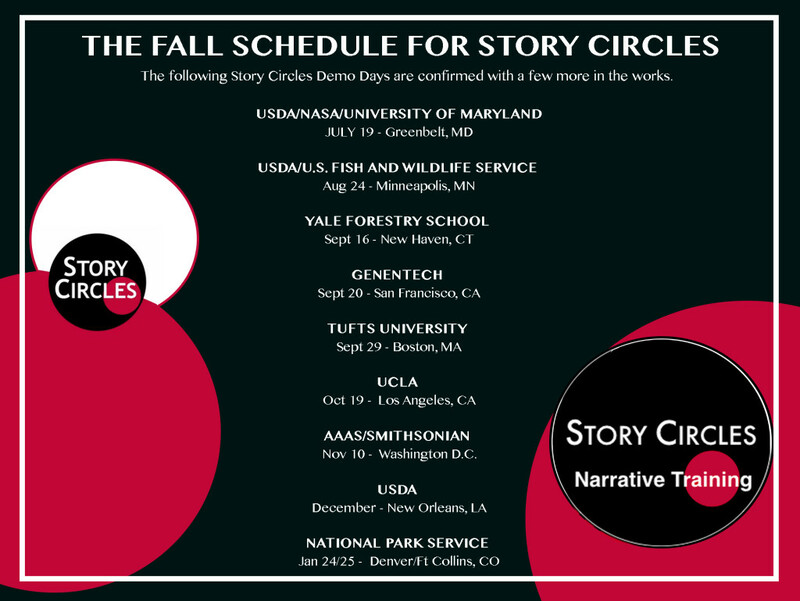 THE FALL TOUR FOR STORY CIRCLES. The two Demo Days we did three weeks ago with USDA, NASA and University of Maryland produced 39 of 80 participants signing up to eventually enter into Story Circles that involve the 10 one-hour sessions. It takes a while to get each one off the ground. From our March Demo Day, we have launched 4 Story Circles (two for USDA, one each for USFWS and USGS) involving 20 of the 35 participants in that Demo Day. This fall’s events should involve at least 500 scientists and communications staff. No telling how many Story Circles will arise from the Demo Days but I’m sure it will be lots (4 are already set for Tufts alone). It’s a slow process, but we are on our way towards establishing small pockets of “narrative culture” meaning groups of workers where everyone in the group is fluent in the narrative language of Story Circles. That is the point where we can start to put an end to painful AAA and DHY miscommunication efforts. A wonderful time lies ahead!